WASHINGTON (CNS) — Bearing witness to life involves living and sharing the good news of Jesus, and reflecting Christ’s love to those around us, Baltimore Archbishop William E. Lori said in an April 1 talk at The Catholic University of America in Washington. Speaking to students, university staff and guests, Archbishop Lori connected what Blessed John Paul II called the Gospel of life with the new evangelization, saying that when Catholics understand the God-given dignity of life in all its stages, they are called to joyfully witness to their faith and share it with their friends and family, and, on a wider scale, through new means like social media. “We need one another, we need the church, we need the Lord if our witness to the Gospel of life is to bear fruit, to change minds and hearts,” said Archbishop Lori. Baltimore’s archbishop, who is supreme chaplain of the Knights of Columbus, spoke on “Being Proactively Pro-Life in Today’s Society.” His talk was sponsored by the university’s chapter of the Knights of Columbus, which has 150 members. He said Blessed John Paul purposely titled his 1995 encyclical “The Gospel of Life” (“Evangelium Vitae”) because our faith’s insights on God’s gift of life and love “flow from the very heart of the Gospel,” from the story of our being created in God’s image, and from the story of Jesus redeeming mankind through his life, death and resurrection. 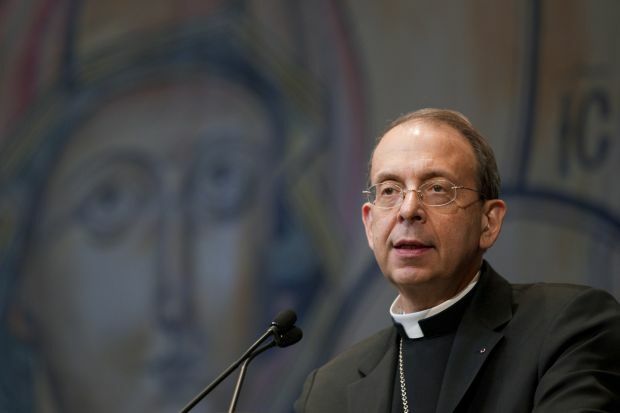 From that understanding, the future saint called on people to prevail over our world’s “culture of death” by fostering a “culture of life” and promoting the dignity of human life in all its stages, from conception to natural death, Archbishop Lori said. “He (John Paul II) wanted to tell us that gift of human life and dignity is good news — good news that the world wants to hear. It is good news for the voiceless, the vulnerable and poor. It is good news for the disabled and chronically ill. It is good news for every person who faces his mortality,” the archbishop said. Pope Francis and Pope Benedict XVI have likewise called on Catholics to bear witness to life, he added, noting how Pope Francis has warned of a “throwaway culture” that threatens vulnerable human life. Archbishop Lori warned people to beware of labels and slogans that are often deceptive when it comes to life issues. The culture also wrongly labels people who defend human life and religious liberty and oppose redefining marriage as rigid, bigots are zealots, said Archbishop Lori. As chairman of the U.S. bishops’ Ad Hoc Committee for Religious Liberty, he has helped lead the church’s opposition to the federal Affordable Care Act’s mandate that would force Catholic institutions to violate their faith by providing employee health insurance coverage for abortion-inducing drugs, contraceptives and sterilization procedures. Those who struggle to promote life, traditional marriage and religious freedom should not let culture speak for them or define them, he said. They should stand up “as an emergent movement in our culture that is eminently reasonable, rooted in faith, young and joyful, a movement determined to make a profound difference in our culture in the years ahead,” Archbishop Lori said. He praised the witness to life offered by a growing number of youths and young adults every year at the March for Life in Washington, which he said resembles the enthusiasm and spirit of faith in the pope’s World Youth Day gatherings. Archbishop Lori encouraged young Catholics to look to Mary for strength and guidance as they bear witness to Christ and his Gospel of life. Zimmermann is editor of the Catholic Standard, archdiocesan newspaper in Washington.